I have been a fan of satellite radio since the beginning. In fact, it’s how I became an expert in the field of mounting. That’s a photo of my first satellite radio that’s next to this article. It had a nice windshield mount that’s still in use today. You can even see my old Garmin mount for a real old Streetpilot GPS. This was one of the first satellite radios that was ever offered. It was put out by Delphi and was called the Skyfi. It was probably twice the size of today’s portable offerings. Functionality wise, it had ten presets, came with a remote control and worked with XM Radio. Since that time, well over ten years ago, XM Radio has been purchased by Sirius and there is only one satellite radio company for consumers. Interestingly, today’s satellite radios are not a lot more advanced than the radios from ten years ago. Some have additional presets, some have the ability to rewind 30 seconds, but they are very similar. When deciding upon which model of radio to purchase, think about where you wish to play it. Most buyers of satellite radios will be placing it in their cars, but some may also want to play it in their homes. Be sure to buy a radio that’s bundled with a car kit. You will find buying a car kit is as expensive as the radio bundled with the car kit. It’s how it’s packaged. Sirius wants to give you a bargain at the purchase then make the money on the subscription. Speaking of the subscription, there are some great ways highlighting how to save a lot of money on your Sirius subscription in this article. Be sure to read it before calling Sirius to activate your new radio. The next important question is how many presets do you need. I have seen radios available which range from ten to thirty presents. Ten channel presets is probably enough, but that’s just my opinion. Another question is if you think you will need to rewind 30 seconds. Keep in mind that you are driving and already have enough distractions. This might be one of those features that you may never use. Lastly, give some consideration about where you would like to mount it. Most of the vehicle kits come with a few mounts including the windshield and vent, a few include one for the dash as well. We wrote a very detailed article on satellite radio mounts and feel there are some better locations than the windshield or vent. You can read that article here. The antenna is another item to consider. The car kit will include an antenna with a very long cable, roughly 20-feet. It’s a magnetic antenna that can be attached to the exterior of your car or using an optional Antenna Mount for Sirius/XM Radio you can place it on the windshield of your car which will result in a lot less cable clutter. There are a few good current Sirius Radio packages on the market. I think the best value is the Onyx EZ Sirius Radio with Vehicle Kit. It has a very low price and includes everything you need to get started with satellite radio. It’s easily portable, has ten channel presets and will transmit the satellite radio signal to your FM Radio in the car. The vehicle kit includes the powered dock, a few mounts, the antenna and a car charger. A premium model of this is called the Onyx Plus Sirius Radio with Vehicle Kit. It has 30 channel presets and a rewind feature which can take you back 30 seconds in case you missed a play or want to hear part of a song over. 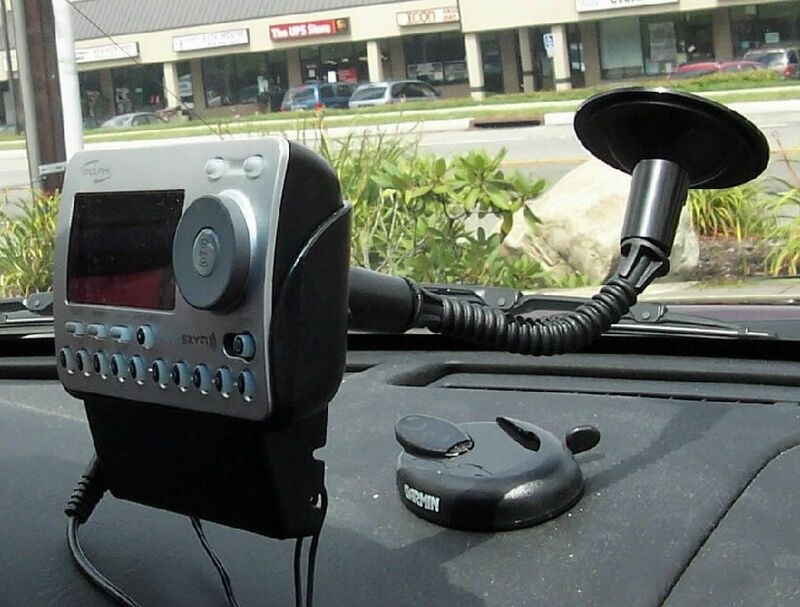 Like the previous radio, the vehicle kit includes the powered dock, a few mounts, the antenna and a car charger. The Onyx Plus Sirius Radio with Home Kit is also an option for those that wish to use their radio at home instead of the car. The Connect Tuner for Sirius Radio is new technology that isn’t a traditional radio. It’s a tuner that plugs into your existing radio. This is what is needed for those that have a high end car radio that is Sirius/XM ready and want to add satellite radio capability to it. It’s also appropriate for those that may not have anywhere to place another radio in their car. You need to be somewhat comfortable working on your car with this one because it requires some wiring and you need the ability to tuck the unit away behind the dash. This is an excellent solution as it will allow you to get the best reception from the Sirius module to your car radio since it is directly wired to your car radio versus transmitting to an empty FM frequency. Once you get it, you will not listen to anything else. Sirius Radio boosts the channel selection and clarity of your reception to the point you will not want to go back to regular FM.